Kamnoetvidya Science Academy with the former name of Rayong Science Academy (RASA) was founded in 2013. The name Kamnoetvidya which literally means “The Genesis of Knowledge” was given by Princess Maha Chakri Sirindhorn who on 6 August 2015 presided over the grand opening ceremony of the school. KVIS is supported by the RASA foundation with an endowment fund provided by the PTT Group of Companies to ensure sustainability, prosperity, and longevity of the academy. The conception of KVIS was the result of a farsighted vision and a cumulated passion of Dr. Pailin Chuchottaworn, then the chief executive officer (CEO) and president of PTT Public Company Limited, who wishes to see Thailand emerge as a strong power in Science and Technology. Kamnoetvidya Science Academy sets its goal as “being a leading science high school, promoting wisdom for sustainable national development. Educating gifted and talented students in mathematics and science. Nurturing future researchers, inventors and innovators with passion and positive thinking toward nature and mankind”. Kamnoetvidya Science Academy is part of the PTT Wangchan Valley Complex, comprises VISTEC, KVIS, and the PTT Forestry Institute. KVIS philosophy is an extension of the ideology that the PTT Group of Companies has been propagating throughout the country in making Thailand beautiful and healthy by “growing trees”. KVIS set out to be a highly efficient institution for “growing wisdom” for the nation. KVIS believes in delivering a proper education to instill in young and gifted minds core values of good citizenship with high abilities, to be accompanied by high senses of leadership, public consciousness, and appreciating the values of being future researchers on STEM to drive the country forward. KVIS is a full boarding school providing education with special emphases on mathematics, science, and technology to all students of three-year levels comprises Year 10, Year 11, and Year 12 with full scholarship. With a strong intention to provide customized training to the need of individual student, KVIS thus set out for a small class size. KVIS therefore caters for only four classes for each year level having only 18 students in each class. The total number of students on campus at one time would therefore be 216 students. To effectively “growing wisdom” in gifted young minds, KVIS carefully selected high-performing teachers and staff members while providing salaries and fringe benefits at levels well above country averages. The school uses English as the main medium of instruction. Apart from laboratory exercises that go hand in hand with lecture components, each student need to complete a research project prior to graduation. Students are trained to make good uses of extensive databases available online to formulate their research projects. Each student has to do a presentation on research proposal, writing a mini-thesis when the research is completed, and to finally present the final results to other students, staff members and invited guests of the school. These activities place heavy demands on staff members and facilities. It is the duty of the school to provide them with good and sufficient scientific equipment and supporting supplies to meet their needs. 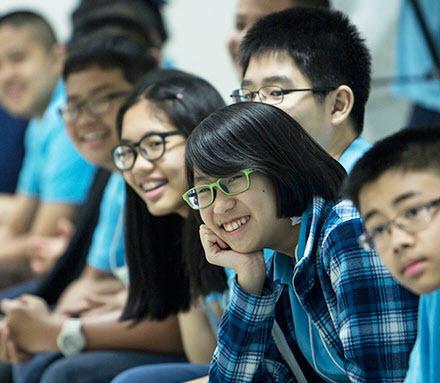 Since its conception, KVIS has been actively engaging in STEM education both at national and international levels. KVIS students have been participating internationally in a good number of events, namely, Korea Science Academy Science Fair (KSASF) in 2015, Thailand-Japan Student Science Fair 2015, Conrad Spirit of Innovation Challenge 2015 at NASA Kennedy Space Center, Kolmogorov Readings 2016 at AESC of Moscow State University, Youth Leadership Program and South East Asian Leadership Program as supported by the US government in 2016, IYPT in Yekaterinburg, Russia in 2016, 12th ISSF 2016 at NUS High School of Math and Science, APCYS 2016 at Amity University in India, the 2016 Asia Pacific Forum for Science Talented at National Taiwan Normal University, and will be participating in Japan Super Science Fair 2016 in November at Ritsumeikan High School at Nagaokakyo Campus. KVIS has already established MOUs with leading gifted schools of the world, namely, (1) Korea Science Academy of KAIST (2) Gyeonggi Science High School for the Gifted of the Republic of Korea (3) G.T. College of Hong Kong and (4) North Carolina School of Science and Mathematics. Plans are in progress to establish MOUs with two Japanese Super Science High Schools, as well as with Kolmogorov School of Moscow State University. KVIS students and staff members have been constantly engaging in learning and teaching exchange activities with international partner schools. Kamnoetvidya Science Academy is proud to be recognized both locally and internationally. The school was visited by two former prime ministers of Thailand, Mr. Anand Punyarachun and Mr. Abhisit Vejjajiva, and also by the current Prime Minister General Prayuth Chan-ocha. All visitors spoke in good favor of the school as an attractive model of science education. 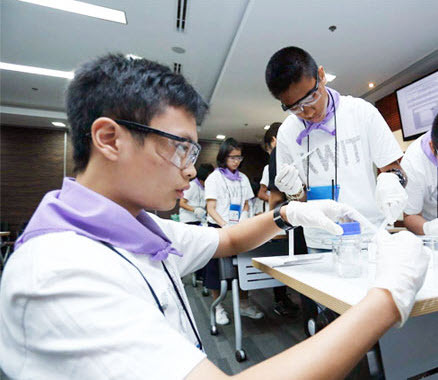 All members of KVIS has strong determination to strive forward for the better on STEM education for both Thailand and the world. In order to fulfill its goal in educating young and gifted mind to a maximum level, KVIS still needs supports from outside agencies. In this regard, KVIS through the RASA Foundation has continuously reaching out asking those who believe in “growing wisdom” in “future researchers, inventors and innovators who have passion and positive thinking toward nature and mankind” to lend supports to KVIS endeavor. In addition to the supports from the PTT Group, up until now KVIS found people, companies, and outside agencies who believe in its course and had lent supports as the followings, (1) contributions to the procurement of scientific instruments for teaching and research at the combined sum of 52 million Bahts, and (2) contributions to the KVIS endowment fund of 74 million Bahts. To ensure sustainability, prosperity, and longevity of the school, KVIS will need to continually seek supports from outside agencies for contributions to the KVIS endowment fund. We sincerely believe that contributions would keep on coming.